I also had a good year in the world of wine. I considered 2016 as "my year of Champagne", and I tasted my way through a variety of non-vintage bruts from some of the well known houses of Reims and Epernay. Red and white wines from France also dominated my palate, along with New Zealand Sauvignon Blanc and Bordeaux blends from the Okanagan. You will see plenty of wines from all of these regions on my top wine list for 2016, along with a few surprises! And with that said, let's get down to business. I tasted so many great red wines this year, it was hard to narrow down this list to just a top 5. Prices range from $20-$35 CDN for all wines except for the top wine, which is $70 +. As per usual, France takes the #1 spot for my white wine of the year - and unlike previous years, almost swept the category! A New Zealand Sauvignon Blanc takes the final spot. Prices range from $22-$35 CDN. This year's focus was on Brut Champagne, so the list is dedicated accordingly. You are looking to spend $45-$70 CDN on these bottles, but definitely worth the splurge for a special occasion! Since my husband is a Port aficionado, Port is the go-to for fortified wines in our house. However, Canada dominates this year's list, with the remaining 3 spots. As most of the wines on this part of the list were gifts, I can't officially comment on price, with the exception of Cave Springs' Late Harvest Riesling; the price in CDN is $30. This is where white wine really shone this year. I wasn't expecting that I would like these (with the exception of Wynn's CSM-I drink at least one bottle of it every year) but they did not disappoint! As per usual, these wines retail for under $20 CDN. Italy takes the top 2 spots as Italian wines are made to be extremely food friendly. Blasted Church's Syrah grabs another spot on my list, as a divine pairing for Filet Mignon. The Porca de Murca Portuguese red is priced under $20 CDN, making it the best value in this category. All other wines listed here are priced between $24-$65 CDN, worth the splurge! -They must be interactive with their followers on social media. When deciding whether or not to use this category in years past, winners would have included producers such as Donnafugata, Tommasi, and Concha y Toro. Therefore, the winery of the year is...Blasted Church Winery, located in Okanagan, BC! Honourable mention goes to Champagne House Taittinger in Reims, France! Thank you both so much for sharing your passion for your wines & champagnes with all your winelover fans! So what's coming up for me in 2017? It's looking to be a busy one! -My Year of...New World Cabernet Sauvignon. Including regions of Chile, California, Washington State, Okanagan, BC, and possibly Australia and South Africa. Hopefully you find this post useful when looking for recommendations, and maybe try a wine you haven't had before on this list or see a pairing idea you like. Cheers to a successful 2016, and I look forward to sharing more of my passion and thirst knowledge quest in 2017! Once upon a time in 1855, the organizers of the Paris Universal Exhibition requested a selection of Bordeaux's best wines to be put on display. A frantic list of the most expensive wines at the time was put together and submitted, along with bottles from the Chateaux that were fortunate enough to make the list. And so the famous -or infamous- 1855 classification was set. A total of 5 tiers were created, from the five renowned Chateaux of the First Growth, to Chateau Cantemerle, the final addition to the Fifth Growth. But what about the rest of the Chateaux not included in the classification? They banded together and created their own tier: The Cru Bourgeois of Bordeaux. I was first introduced to the Cru Bourgeois tier back in 2013, while I was taking WSET Level 3. It just so happened that the wine I liked most that evening was a Cru Bourgeois. When my teacher asked what we thought of the wines overall at the end of the tasting, I mentioned I was enamored with the Cru Bourgeois. She basically laughed at me and dismissed my opinion that a Cru Bourgeois could show well. But wine doesn't have to be all stuffy and upper-class expensive. In today's economy, many Albertans can hardly afford to drink high priced wine. This is a great opportunity for the Cru Bourgeois to shine, reflecting the qualities of Bordeaux terroir and flavours at less than half the price. Here are some Cru Bourgeois recommendations for your enjoyment, all priced around $30-$35 CDN! 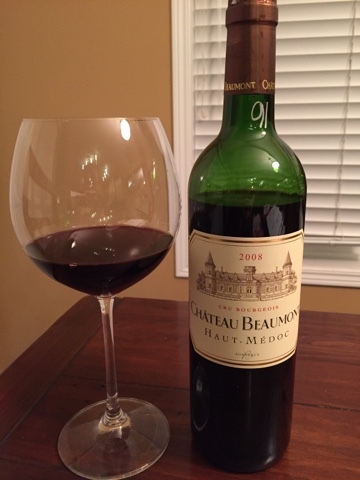 Located in the Haut-Medoc region of Bordeaux, Chateau Beaumont is considered to be one of the top wines in the Cru Bourgeois tier and multiple vintages are highly rated by Wine Spectator each year. The 2008 vintage boasts a fruit-forward bouquet of strawberries and cherries, following through to a palate inclusive of dried cranberries & a hint of tobacco leaf. Racy acidity and silky tannins bring refinement to the well-structured body. An excellent wine to bring to a holiday party or to cozy up with on a cold, wintry night! 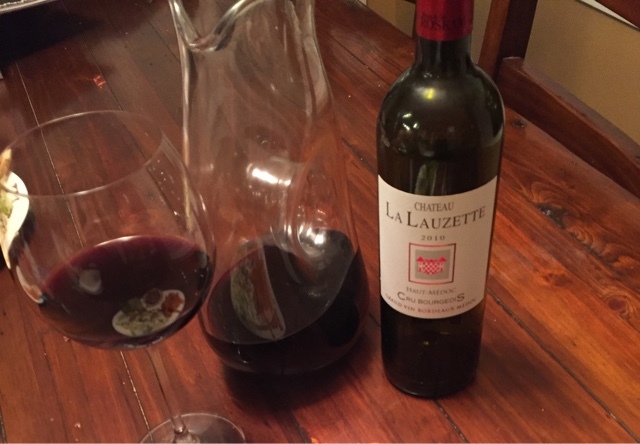 Also located in the Haut-Medoc, Chateau La Lauzette Declercq 2010 boasts a more intense flavour profile of cassis, cigar box and an intriguing hint of eucalyptus. An intense body with firm tannins and razor sharp acidity that carries through the mouthwatering finish. Pairs extremely well with game meats like venison and elk tenderloin. Across the Gironde river lies the lesser-known region of the Cotes de Bourg. 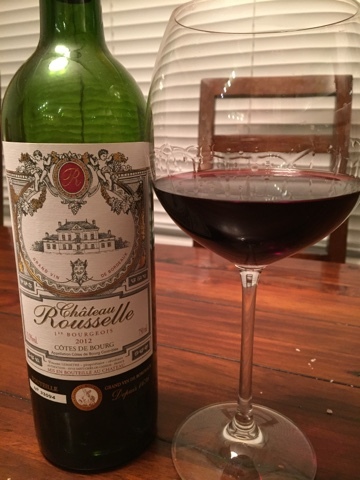 Although the Crus Bourgeois moniker primarily is used on the Left Bank (Haut-Medoc, etc), Chateau Rousselle is labelled as a Premier Bourgeois, which is the highest classification level of its appellation. The 2012 vintage shows the Merlot-dominant blend with notes of black cherries, plum and bittersweet chocolate. Juicy acidity and muscular tannins round out the firm, plush body. Worthy of cellaring another 5-7 years to settle the tannins, but still shows well now if you like powerful reds! For more information on all the Chateaux included in the Cru Bourgeois, the history and current news, visit the official website here. And finally, I'd like to thank all of you who read my blog for allowing me to share my passion of wine with you. I truly appreciate all of the support you have given me, even if I don't get to post blog entries as much as I'd like. 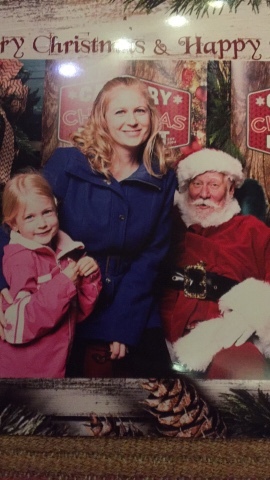 On behalf of my little girls and my husband, I'd like to wish you all the happiest of holidays, and a wine-derful 2017! August was a bittersweet time to be Canadian. On the sweet side, our country "showed up" to the Rio Olympics, winning 4 gold medals and a record high 22 overall medals-unheard of in previous summer games. Canada proved to the world that we are a force to be reckoned with in women's swimming, women's trampoline, and men's track and field, among other sports. But we also excel in winemaking, especially with Riesling and Chardonnay in the Niagara region of Ontario, and with the Bordeaux varietals in the Okanagan. The problem? The world has yet to realize it. Notorious Wine Spectator columnist Matt Kramer has noticed and has mentioned this in some of his monthly columns. Hopefully this will be the catalyst to put Canada on the worldwide wine radar. I decided to celebrate our Olympic gold medal wins by toasting the athletes with some of the Okanagan's fine red wines. Our first gold medal win was by Penny Oleksiak on August 11th in the women's 100m freestyle. Penny really did Canada proud by winning a total of 4 medals in the Rio games! 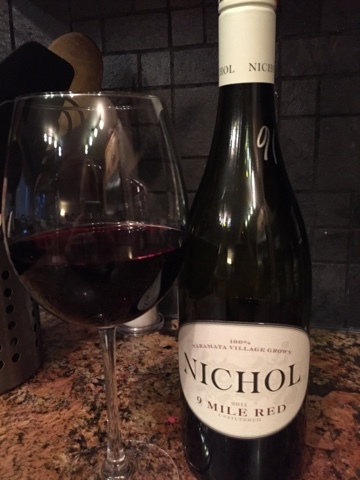 To celebrate her gold medal win, I selected Nichol Vineyard's Nine Mile Red Blend. Composed of Pinot Noir and St. Laurent, this unfiltered red opens with a bouquet of strawberries and forest floor that follows through to the palate, along with flavours of underripe cherries and a hint of cooked mushrooms on the finish. Surprisingly smooth for an unfiltered wine, with silky and focused tannins. The Pinot Noir really shines through on this wine! Drink now, or cellar for 3-5 years. Our next gold medal in the games was won by Rosie MacLennan on the trampoline on August 12. Celebrating a back-to-back gold medal win was extra sweet for her as she suffered a concussion in 2015. 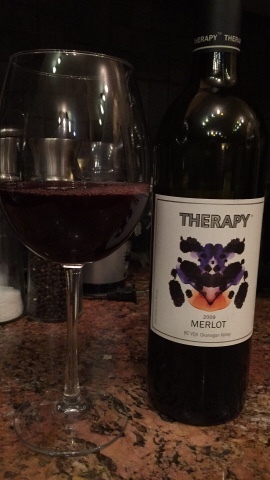 Because of all the therapy she required to get her ready for Rio, I found it fitting to select Therapy Vineyard's 2009 Merlot to toast her with. Deep garnet in colour, showing its age with aromas of pepper and musk on the nose. A lush, full body and mouthwatering acidity open the palate, alongside flavours of raspberries, pepper and asparagus. Tannins are muscular yet refined and there is a herbaceous hint on the finish. Drink now. Derek Drouin was Canada's third gold medal winner in Rio, winning the men's high jump event on August 16. I selected Kettle Valley's 2009 Merlot to celebrate his victory. A pronounced nose of red currants and cedar leads into a palate of fresh raspberries, cloves, and a hint of smoky cedar. The acidity is refreshing, and tannins are faint and soft. Cherry notes stand out on the long, smooth finish. A fantastic expression of Okanagan Merlot that pairs well with grilled red meat. Canada's fourth and final gold medal was won by Erica Wiebe in women's wrestling on August 19. Since I had to finish on a "punny" note, I selected the 2013 Cellar Hand Punch Down Red blend, created by Black Hills Estate for all the smackdowns that Erica laid upon all her opponents to become the Olympic champion! A real gem of a wine! Bright ruby in colour, the wine will draw you in with a sweet bouquet of ripe cherries and orchids. Racy acidity and velvety tannins seduce on the opulent palate, along with flavours of raspberries, smoke, and a tiny whisper of fresh basil on the long finish. Extremely well structured and vivid. Opens up nicely now, or could age another 5 years in cellar. Perhaps one day Canadian wines will be known around the world, but we still have a long way to go. As more global wine experts discover the region, and Kelowna tourism increases, BC Wine will slowly find their place in the worldwide spectrum. In the meantime, more for me! Don't save a thing for later. So go ahead and drink the wine. Don't save those bottles in the cellar for a special occasion for too long; no one knows how long any of us have left. Savour the sweet sips, as well as every moment in life and love.